The sweetness of dark chocolate is perfectly associated with tangy orange notes in this shortbread. 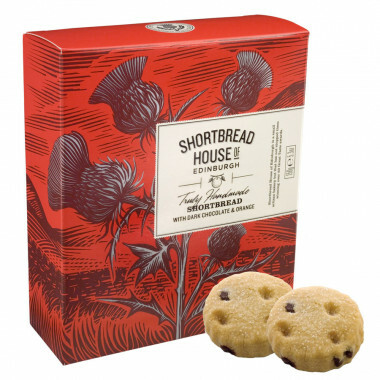 These shortbreads are handmade in Scotland. Gourmet, sprinkled with sugar, the biscuits are made with dark chocolate and orange. Ingredients: flour (wheat flour (gluten), calcium, iron, niacin, thiamin), butter (milk, salt), sugar, chocolate (8.5%) (cocoa Mass, sugar, cocoa butter, fat reduced cocoa powder, emulsifier: soya Lecithin), ground rice, vegetable oils (rapeseed & segregated sustainable palm oils), orange oil (0.6%).